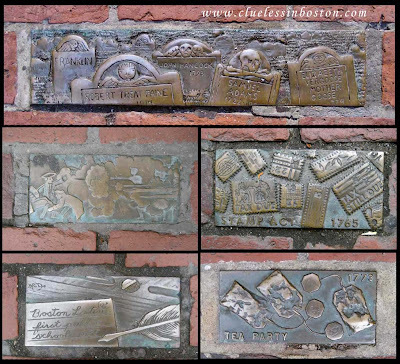 The top picture contains tombstones from the Old Granary Burial Ground on Tremont Street; on the left below is a copy of Paul Revere's copper etching of the Boston Massacre; next to that are various stamps used by the British to enforce the Stamp Act of 1765; on the bottom row is Boston Latin School, the first public school in America, 1635; and in the lower right corner is the Boston Tea Party of 1775. I'm glad I looked at the updates before shutting down for the night. That's a great collage! And you chose to show some of the nicest ones. Going to bed now. Have a lovely Wednesday, Jim :). Wow..thanks. I love learning something new about my hometown! I have been in SF for thirty years, and I don't remember this lane. It must have been put in after I left. I will visit it the next time I'm in BeanTown. Of course I'll never forget Arch Street Church! All those Ash Wednesdays! !